Award-winning director and photographer James Morgan set out to capture the lives of the Bajau Laut, the world’s last true marine nomads. These Malay peoples have lived at sea for centuries, plying a tract of ocean between the Philippines, Malaysia and Indonesia. 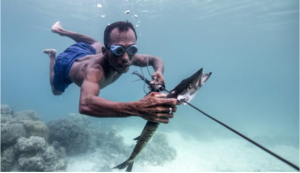 Morgan highlights efforts to conserve their culture and the spectacular underwater environments the Bajau Laut have called home for centuries. For generations, the Bajau skilfully adapted to their maritime environment. Their knowledge was revered by regional leaders who used them to establish and protect new trade routes. As well as being legendary navigators, they were also highly skilled free divers, plunging to depths of more than 30 metres on a single breath. Over the last two decades, controversial government programmes across the region have forced most of the Bajau to settle on land or in stilt villages at the water’s edge. They now forage and subsist on whatever they can harvest from coral reefs, selling their meagre catches at local markets. Economic pressure has seen their fishing practices become destructive with regular use of dynamite and cyanide, destroying the environment that sustains them. Things are changing now as charities create marine management programmes that encourage sustainable practice and a return to traditional fishing methods. This will help ensure their way of life is preserved in the future.